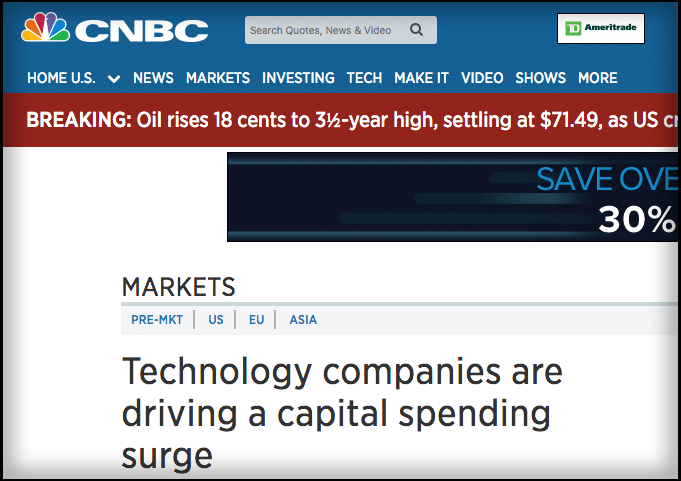 But for all the investment, it turns out that the bulk of it is actually in technology. Isn't it time to get a little grease under our finger nails and drive capital investment in SMB industrial firms and manufacturers as well? That's the huge opportunity I see for companies to close some stagnant deals and move new ones along to success. In order for that to happen, however, capital equipment sales people have to understand the opportunity so they can present options to prospects and suggest the questions which buyers can ask of their accounting and tax advisors. That's why I've created this on-demand webinar with some of the tax and business accounting experts from CliftonLarsonAllen. 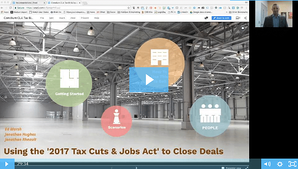 It's a simple introduction to how the changes impact the post tax net cost and cash outlay for pass through businesses buying capital equipment under the "2017 Tax Cuts & Jobs Act." Industrial sales people would do their customers a disservice by offering definitive accounting and tax advice. However, if they're familiar with the broad brush implications of the changes in tax law they can offer some suggestions and ask some questions to help prospects dive deeper with their advisors. Accelerated depreciation can drive down the effective cost of machine investments, lowering barriers to capital equipment sales. Combined with capitalized lease arrangements it can even yield a positive cash impact in the year of acquisition. While it's easy to assume that the tax advisors for every prospect have briefed them on the impact of these changes, often advisory relationships are less proactive. It's likely that many industrial sales prospects are only vaguely aware of the benefit of purchasing equipment now. That creates an opportunity for informed sales people. What kind of deals might be most impacted by these insights? I suggest starting with those that seemed so sensible and so close but stagnated over the last 6-18 months. Often the status quo prevails when the perceived risk is higher than the perceived benefit. If you can reduce risk by reducing the net cost through tax savings (NOT a discount), particularly in conjunction with clear explanations of how implementation will be efficiently achieved and how the desired outcome (improved performance, reduced cost, etc.) will result, you can help tip the scales toward action. Presented correctly - maybe a fact sheet which they could use to guide the questions they'll have for their accounting and tax advisors - this might be enough to breath fresh live into those deals and move them over the line. You've probably heard the statistic from LinkedIn research that 74% of the time buyers select the vendor that first provided value as they worked to understand their problem and potential solutions. You might have read my article last week on helping prospects understand "how" to buy instead of "what" and "why." Here's your opportunity to do both - to demonstrate your value as a business resource and to distinguish yourself from the technical experts against who you compete. But further, help to simply the procurement process with insights that they'll value. If this sounds like something that belongs in your capital equipment sales toolkit, then take the 30 minutes to watch the webinar. We give just enough accounting background so the pieces all fit together, and we use a some really practical examples of capital equipment sales scenarios to demonstrate the impact.